George Woodcock (1912-1995) was a historian, political biographer, essayist, poet, and anarchist. He wrote biographies of such anarchist thinkers as Pierre-Joseph Proudhon, William Godwin, Oscar Wilde, and Peter Kropotkin. Throughout his life, Woodcock was given numerous awards for his work, but he refused several awards from the government of Canada on the grounds that he only accepted awards granted by his peers. Chapter 1 of "Socialism from Below" is Woodcock's evaluation of the Second World War (which went on for more than a year after the publication of the book) and an overview of the political culture of the pre-war era. Woodcock argues that the two opposing sides--the Axis and the Allies--represented two competing forms of totalitarianism: fascism on the one side, and the dictatorship of capital on the other. In this chapter, Woodcock discusses the philosophical bases for "society," the groups of individuals who cooperate together for the common good. But capitalism and the state have perverted the purposes of society, stripping individuals of their freedom and preventing the flourishing of humankind. In this chapter, Woodcock dispels many of the common myths about anarchism, and he addresses the fundamental flaws of government, the state, and bourgeois democracy. He argues that if one is committed to both freedom and justice, the social philosophy of anarchism is the only tenable option. In this chapter, Woodcock addresses of the precursors of anarchism, including Lao-Tze's teachings on Taoism, Gerrard Winstanley and the Digger movement, William Godwin's treatises on anti-authoritarianism, and Pierre-Joseph Proudhon's various works on government and property. In this chapter, Woodcock recounts a short political biography of Michael (Mikhail) Bakunin (1814-1876) and the First International. Bakunin was an anarchist revolutionary who fought in several uprisings and who arguably led the first bona fide anarchist efforts to create a social revolution. He also clashed with Karl Marx, forming the two primary factions of radical leftist revolutionaries in Europe at the time: the Marxist communists and the Bakuninist anarchists. In this chapter, Woodcock recounts a short biography of Peter Kropotkin (1842-1921), the Russian revolutionary anarchist theorist. Woodcock argues that Kropotkin brought scientific and theoretical rigor to anarchist thought, which had been previously underdeveloped. Kropotkin argued that human societies were fundamentally cooperative, that Bakunin's collectivist anarchism was unable to account for modern industrial processes, and that communal ownership of both the means of production and the products of labor was needed to guarantee both necessities and luxuries could be provided for all members of society. In this chapter, Woodcock discusses the growth of the anarchist movement between the death of Bakunin and the First World War. On the continent, Bakunin's (and Kropotkin's) influence continued to fuel anarchist movements and actions, but the eventual rise of anarcho-syndicalism fundamentally shifted anarchists' focus from localized propaganda to organizing workers in the workplace. In this chapter, Woodcock discusses the roots and growth of anarcho-syndicalism, the anarchist school of thought that began in the early-nineteenth century but came to full prominence at the beginning of the twentieth century in England, the US, and Spain. Anarcho-syndicalism is both a system for fostering revolutionary feeling in the working class and a system for a fair distribution of resources after the revolution. Anarcho-syndicalists seek to organize workers on the job in order to assert control over the means of production. Through direct action, anarcho-syndicalists assert they can overthrow capitalism and the state by direct action of the workers. In this chapter, Woodcock discusses the anarchist movement in the United States. He contends that, similar to Europe, the American anarchist movement evolved until it fused with anarcho-syndicalist thought, leaving labor organizations like the Industrial Workers of the World (IWW) as the most important revolutionary organizations in the US. In this chapter, Woodcock briefly summarizes the anarchist movement during the Russian Revolution. Led by Nestor Makhno (1888-1934), a Ukrainian peasant turned guerrilla fighter, the anarchists successfully fought against the Whites, the Reds, the Germans, the Austrians, and other factions while securing the Ukrainian Free Territory for an anarchist society. But by the end of the Russian Civil War, as the Bolsheviks were emerging victorious in their rush to control the Russian state, they turned on the anarchists and violently repressed the blooming anarchist federation in Ukraine. 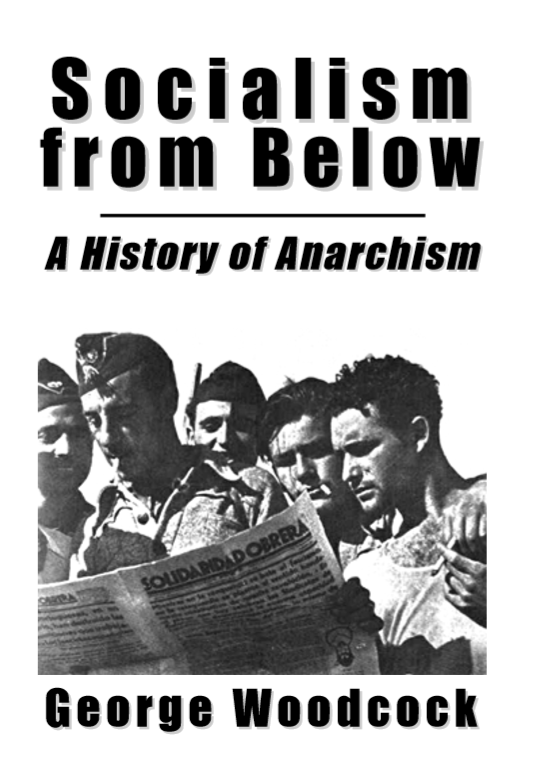 In this chapter, Woodcock recounts the most successful anarchist experiment of the twentieth century: Revolutionary Catalonia in Spain from 1936 to 1939. The anarchists successfully collectivized agricultural, factory work, and municipal jobs, leading in almost every case to increased productivity and happier people. But similar to Ukraine following the Russian Revolution, the Spanish anarchist society was brought down by outside forces, principally the Spanish communist party and the fascists. In this final chapter, Woodcock provides an anarchist perspective on World War II, which was happening as he wrote the book. He argues that the myths of the Allies--that they were fighting for freedom against fascism--could be easily disproved by analyzing the prevailing social and economic conditions of those countries. The Allies were authoritarian as well, differing only in degree, but even those differences were eroding during the war. The real struggle, as Woodcock contends, was not the Allies against the Axis, but the working people of all countries against their rulers.